Begin your Marco Island retreat at this luxurious 2-bed, 2-bath vacation rental condo that sleeps 7! This wing unit with 2 balconies promises incredible sunrises and sunsets over the Gulf of Mexico, along with all of the comforts of home. Even enjoy the resort's amenities including a pool, fitness center, and tennis courts. In addition, the property features an idyllic location on the white sugar sand beach and minutes from restaurants, pubs, and shopping - so go ahead and clear your calendar! Start your day on the east-facing balcony; sipping coffee as the sun brings Marco Island to life! Once late snoozers rise, head back inside for a hearty breakfast easily prepared in the fully equipped kitchen. Fuel up around the 4-person dining table before heading down to the white sand beach - located just steps from the resort! After achieving the perfect sun-kissed tan, return to the beautifully furnished condo for a welcomed air-conditioned reprieve! Relax while watching shows on the flat-screen cable TV or let the soothing sound of waves carry you into the perfect catnap. Happy hour awaits on the furnished wraparound balcony! Sip your favorite drink while soaking in the vibrant Gulf of Mexico sunset that you've always heard about. Compete the day with a long shower in one of the 2 full bathrooms. Happy and clean, crawl into the master bedroom's king bed for a night of deep sleep - restoring you for tomorrow's adventures. The second bedroom is perfect for small families or the kiddos of the group! Featuring a prime location steps from the beach, South Seas Towers is your next go-to stay whenever you visit Marco Island! Take a moment to peruse the variety of day-trip brochures located at the resort to choose your next adventure. Airboat rides, dolphin watch cruises, and deep sea fishing are just a few of your options! When you're not lounging on the beach or by the resort pool, check out the Marco Island Historical Museum or stroll through the Frank E. Mackle Community Park. The golfers of the group might prefer time spent on the green fairways of The Island Country Club! A day trip to Key West is also a great activity! Catch a water taxi to carry you to the island for time spent snorkeling, sunbathing, and exploring Florida's southernmost point. Not only are you close to plenty of attractions, the condo is also minutes from great restaurants, bars, and shops. Start your day with breakfast at Empire Bagel Factory - quickly followed by a morning pick-me-up at Doreen's Cup of Joe. For lunch, dine at NeNe's Kitchen, and for dinner, treat yourself to Fin Bistro, offering fresh fish and seafood dishes. - Idyllic Marco Island location just steps from the beach and minutes from local attractions, restaurants, shops, and much more! Nice location, nice amenities, and decently appointed. The unit was clean, roomy and inviting. It was an end unit with a spacious wrap around balcony. Would like to stay here again. Excellent property on Marco Island! I was lucky enough to go to Marco Island with a friend and we stayed in this condo for nine grand days! It was as advertised and the owner was very quick to reply to any and all questions both before and after our arrival. The pool was closed for repairs but is scheduled to open September 23. We were able to use another pool while there, but were mostly at the beach. Be sure to take your walking shoes - it’s a nine minute walk to the Gulf. But there are no dunes or obstacles and your reward is sun and surf galore! The beds were comfortable with nice linens and bath towels were grand. Lots of beach chairs and things you need for pool and sand were available. The great balcony was used for hours on end! Again, the owner was great to work with and very accommodating to our requests. 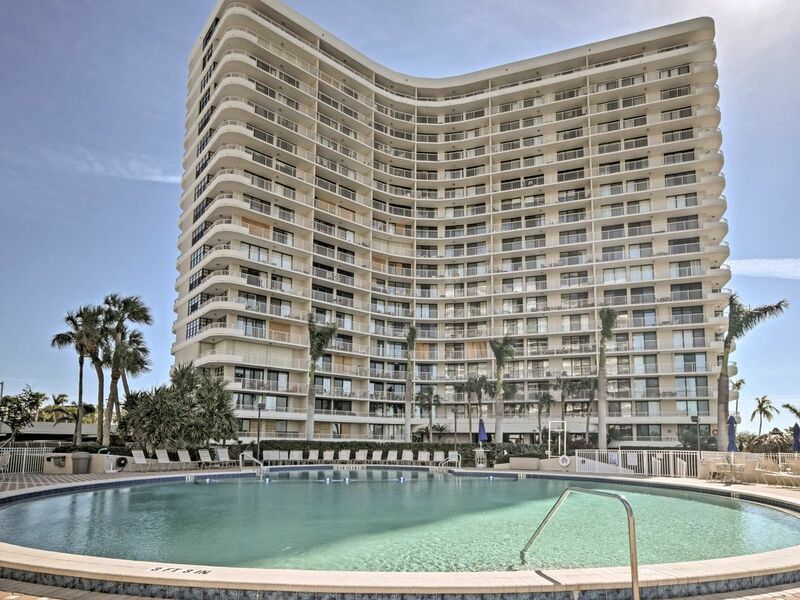 So happy to have found South Seas Condominiums!